Menus and context menus display a list of commands or options when the user requests them. Use a menu flyout to show a single, inline menu. Use a menu bar to show a set of menus in a horizontal row, typically at the top of an app window. Each menu can have menu items and sub-menus. 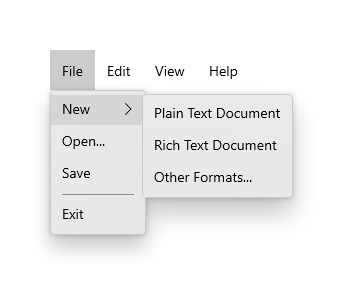 Menus and context menus save space by organizing commands and hiding them until the user needs them. If a particular command will be used frequently and you have the space available, consider placing it directly in its own element, rather than in a menu, so that users don't have to go through a menu to get to it. Menus and context menus are for organizing commands; to display arbitrary content, such as a notification or confirmation request, use a dialog or a flyout. To show a menu in a flyout attached to an on-canvas UI element, use the MenuFlyout control to host your menu items. You can invoke a menu flyout either as a regular menu or as a context menu. A menu flyout hosts a single top-level menu (and optional sub-menus). To show a set of multiple top-level menus in a horizontal row, use a menu bar. You typically position the menu bar at the top of the app window. MenuBar and CommandBar both represent surfaces that you can use to expose commands to your users. The MenuBar provides a quick and simple way to expose a set of commands for apps that might need more organization or grouping than a CommandBar allows. You can also use a MenuBar in conjunction with a CommandBar. Use the MenuBar to provide the bulk of the commands, and the CommandBar to highlight the most used commands. 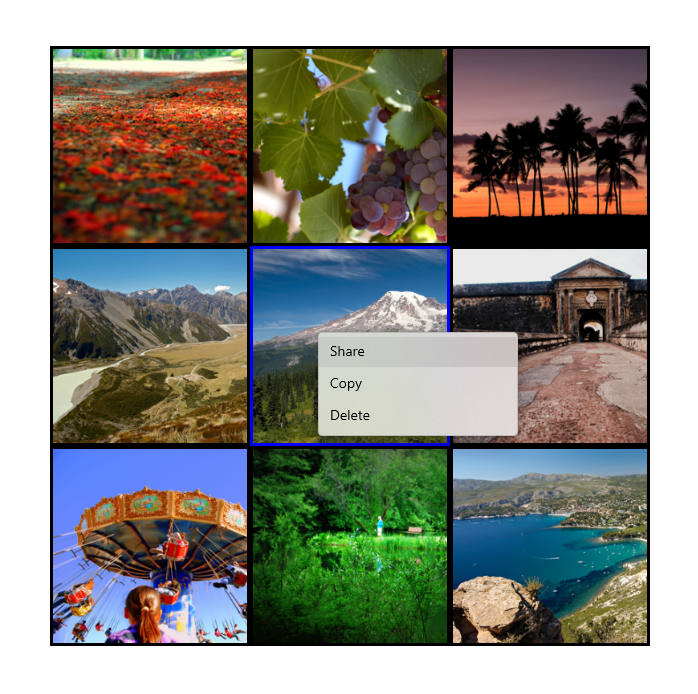 If you have the XAML Controls Gallery app installed, click here to open the app and see the MenuFlyout in action. Menus and context menus are similar in how they look and what they can contain. In fact, you can use the same control, MenuFlyout, to create them. The difference is how you let the user access it. 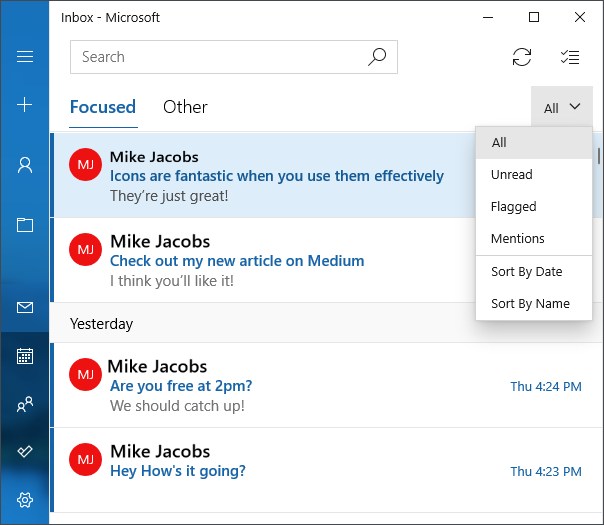 When should you use a menu or a context menu? If the host element is a button or some other command element whose primary role is to present additional commands, use a menu. If the host element is some other type of element that has another primary purpose (such as presenting text or an image), use a context menu. For example, use a menu on a button to provide filtering and sorting options for a list. In this scenario, the primary purpose of the button control is to provide access to a menu. If you want to add commands (such as cut, copy, and paste) to a text element, use a context menu instead of a menu. In this scenario, the primary role of the text element is to present and edit text; additional commands (such as cut, copy, and paste) are secondary and belong in a context menu. Have a single entry point (a File menu at the top of the screen, for example) that is always displayed. Are usually attached to a button or a parent menu item. Are invoked by left-clicking (or an equivalent action, such as tapping with your finger). Are associated with an element via its Flyout or FlyoutBase.AttachedFlyout properties, or grouped in a menu bar at the top of the app window. Are attached to a single element and display secondary commands. Are invoked by right clicking (or an equivalent action, such as pressing and holding with your finger). Are associated with an element via its ContextFlyout property. The most commonly used items. Menu items whose icon is standard or well known. Menu items whose icon well illustrates what the command does. Don't feel obligated to provide icons for commands that don't have a standard visualization. Cryptic icons aren’t helpful, create visual clutter, and prevent users from focusing on the important menu items. The size of the icon in a MenuFlyoutItem is 16x16px. If you use SymbolIcon, FontIcon, or PathIcon, the icon automatically scales to the correct size with no loss of fidelity. If you use BitmapIcon, ensure that your asset is 16x16px. To create a menu flyout or a context menu, you use the MenuFlyout class. You define the contents of the menu by adding MenuFlyoutItem, MenuFlyoutSubItem, ToggleMenuFlyoutItem, RadioMenuFlyoutItem and MenuFlyoutSeparator objects to the MenuFlyout. MenuFlyoutSubItem—Containing a cascading list of menu items. ToggleMenuFlyoutItem—Switching an option on or off. RadioMenuFlyoutItem—Switching between mutually-exclusive menu items. This example creates a MenuFlyout and uses the ContextFlyout property, a property available to most controls, to show the MenuFlyout as a context menu. // Change the color from red to blue or blue to red. The next example is nearly identical, but instead of using the ContextFlyout property to show the MenuFlyout class as a context menu, the example uses the FlyoutBase.ShowAttachedFlyout property to show it as a menu. Light dismiss controls such as menus, context menus, and other flyouts, trap keyboard and gamepad focus inside the transient UI until dismissed. To provide a visual cue for this behavior, light dismiss controls on Xbox will draw an overlay that dims the visibility of out of scope UI. This behavior can be modified with the LightDismissOverlayMode property. By default, transient UIs will draw the light dismiss overlay on Xbox (Auto) but not other device families. You can choose to force the overlay to be always On or always Off. MenuBar requires Windows 10, version 1809 (SDK 17763) or later, or the Windows UI Library. You use the same elements to create menus in a menu bar as in a menu flyout. However, instead of grouping MenuFlyoutItem objects in a MenuFlyout, you group them in a MenuBarItem element. Each MenuBarItem is added to the MenuBar as a top level menu. This example shows only how to create the UI structure, but does not show implementation of any of the commands.